As a follow up to the recent Stork auction news, seller wooyay has provided a number of new photos for you to oogle. It really does look like a nice, smart machine, although a translucent case and glowing GCSE Technology grade acrylic panels would go down a treat. It worked for Apple. We could take the time to explore the many what-ifs (cough, RiscStation) but we might end up encouraging all sorts of DIY laptop projects. So instead, we'll leave you with this piece of history, literally. The Stork prototype, and note the cool green key labels. So Acorn. The ports (from left to right) are: port replicator (a replicator is a unit that provides keyboard, mouse, VGA output etc. ); parallel port (where the floppy drive connects), and 9-pin serial port. Also, the rounded thing on the left side is actually one of the mouse buttons. 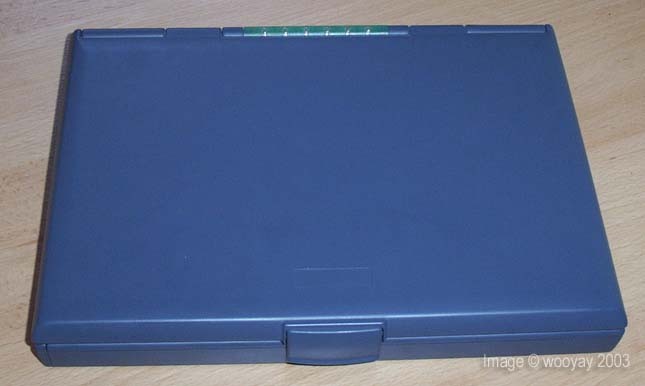 PCMCIA slot, two mouse buttons and power button. Headphone socket and reset button. Below the serial number sticker is the internal access panel (see last photo). Who needs floppies when one can have ethernet? Oh ok, floppy it is then. The laptop battery slides out into view. With the access plate removed, you can get at the two 4MB RAM modules. The Acorn Stork prototype portable runs RISC OS 3.6 and is driven by an ARM7500 processor. It never made it into production. Lovely photos. What HAS happened with the RiscStation? Do people still have deposits down? Sad to hear no news. Hmm. Stork 14 - I wonder how many they'd made. Probably between 20 and 50 (nearer the lower end). Anyone got any ideas? Sorry too late on the DIY laptop. Mines almost built. Well it's more of a luggable than a laptop, but it does work. The problem with laptopping the RISC PC is the processor card, it sticks up far to much. Never mind it works fine apart from getting rubbish modem speeds for some reason! One of our RISCOS.be members did something similar : <URL:[link] (Photo (c) Ike Busser).